Turnkey Construction and Roofing is currently upgrading the roofing systems on two buildings on campus for a local school. The projects are being performed for F.H. Paschen, S.N. Nielsen’s Job Order Contract Division. 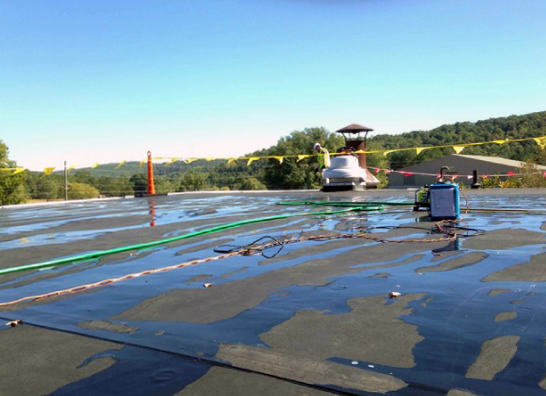 On the Boiler Building – the building on campus that houses the school’s mechanical systems – Turnkey recommended an upgrade rather than replacing the entire roofing system, which will ultimately extend the life of the roof for an additional 15 years. “The repairs to the Boiler Building will take this building out another 15 years before the school has to replace it, which saves our client a great deal of money,” said Karl Ek, vice president, Turnkey. “It is a safe, effective system upgrade that is the better choice at this point,” he added. Specific work includes removing dormant mechanical equipment, removing the old gutters and reinstalling new gutters, resealing the edge flashing, and capping and sealing the curbs. This project began mid-October and wrapped up in just one week. The second building, the Activity Building, is a much larger building with a metal roof that is more complex. “Because this building has a large, complex metal roofing system, we recommended building a roofing system over the existing metal roof, which is in itself complex but pales in comparison cost-wise to removing and completely replacing the metal roof,” Ek explained. Turnkey worked with the engineered scope to develop a plan that involves creating a system to build a shingled roof over the metal roof and connect them. Work is currently under way and should be completed within 3-4 weeks. “Turnkey was chosen because they have the expertise to complete a challenging project like this in a working environment,” said Leo Wright, vice president of F.H. Paschen, S.N. Nielsen’s Job Order Contract Division. “Turnkey also has the local talent and resources needed to get these projects completed for us on a fast-track basis without sacrificing quality,” he explained. The project is being completed under the EZIQC Program, which is Paschen’s Job Order Contract system offered to municipalities and agencies throughout the country to “fast track” their small to medium size projects using an agreed upon unit pricing system. 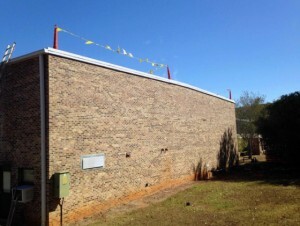 Also for Paschen, Turnkey most recently completed replacing the roofing systems on six buildings for one of the oldest units in U.S. Army history, the 48th Infantry Brigade of the Georgia Army National Guard. Other work for Paschen includes a project for the Georgia Department of Transportation and renovations to Georgia College’s Milledgeville Campus, which included installing ceiling systems throughout the campus’ basketball arena and completing flooring work in the campus’ library. In recent years, Turnkey also completed rehabilitation work to the exteriors of Georgia College’s Milledgeville Campus historical buildings for Paschen. In 1975, Frank H. Paschen founded Chicago Building Constructors, a general contracting company performing mostly remodeling and rehabilitation work in the Chicago area. In 1985, the company changed its name to F.H. Paschen, Inc. During this time, Paschen embarked on a period of sustained growth, successfully expanding again into new markets, including municipalities, school districts, colleges and universities and public housing authorities, and formed their Job Order Contract (JOC) Division to better serve our new and growing clientele. In 1992, F.H. Paschen expanded once again with the acquisition of S.N. Nielsen, one of Chicago’s oldest active general contracting firms, specializing in construction of health care, educational and institutional facilities. Today, F.H. Paschen, S.N. Nielsen has operations in Illinois, Florida, Louisiana, Washington D.C., Pennsylvania, Indiana, Georgia, Ohio and Wisconsin and consists of over 200 technical professionals covering all construction disciplines. For more information, visit www.fhpaschen.com. Turnkey Construction and Roofing is a woman owned business headquartered in Atlanta, Georgia, that provides construction and roofing services throughout the greater Atlanta area. The team consists of professionals who have more than 50 years of experience in commercial and residential construction. Turnkey offers a comprehensive list of services from the simplest to the most complex of general contracting services within the residential and commercial markets. More information can be found at www.turnkeyga.com or by calling (404) 799-7902.